In the boarder region of Germany and Austria the snow ploughs have a lot of work with March continuing to be a very snowy month, especially in and around Oberstdorf in Germany (the local ski hill of Nebelhorn had 80cm/nearly three feet in the past seven days. "For the staff on the slopes and from the road department it's a very tough job these days to get the slopes, roads, pavement and hiking trails fit for service quickly." Rolf Köberle of Kleinwalsertal Tourismus, another area hit by more heavy snow, told Skiinfo. 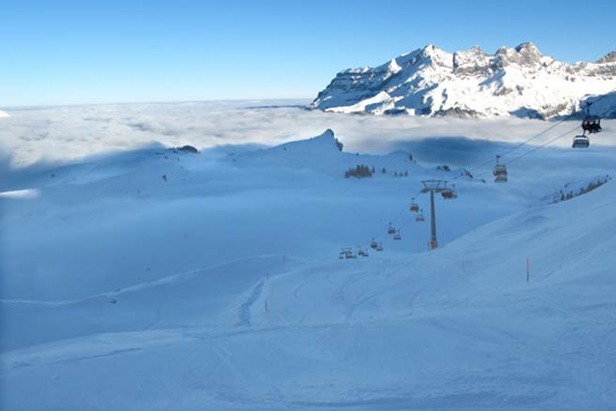 "The team are working especially hard however as sunny weather and warmer temperatures are expected from Friday onwards and we expect a lot of skiers will want to get here to enjoy the great conditions." Mr Köberle concluded. There is lot of new snow again in Austria with some areas reporting up to 95cm (over three feet) in the past seven days. Important resorts like the Skiwelt region, Saalbach, Hochfügen, Ischgl and Silvretta Montafon each had at least 20cm (eight inches) during the last 24 hours. St. Anton and Kaprun/ Kitzsteinhorn had 30cm (a foot) each yesterday, so the latter has more than four metres (13 feet) on the glacier now. Avalanche risk has also risen again, in parts of the Steiermark, Upper Austria, Tirol and Vorarlberg it is high (level 4) today, so staying on the marked slopes, where conditions are fine, is strongly recommended there. In Kühtai in Tirol an avalanche came down on a road this morning but luckily did not harm any people. The Central Institute for Meteorology and Geodynamics (ZAMG) in Austria expects up to 50cm (20 inches)of new snow in Tirol and Vorarlberg for today. In Switzerland alone there have been more than 50 powder alarms this morning. Five resorts reported more than a metre in 7 days and the avalanche risk reaching 4 in some areas (the highest is level five). Andermatt-Gotthard now has a 500cm (17 feet) base on upper slopes and some Swiss ski areas report up to 140cm (4.7 feet) of new snow in the past seven days.